Track is my favorite sport. My earliest memories go back to the 1968 Olympic Games in Mexico City where Bob Beamon soared almost two feet beyond the existing world record in the long jump; and Jim Ryun, arguably the greatest miler of all time, learned a painful lesson about the benefits of altitude training. I was inspired by those Olympics and began competing in the seventh grade. Although I had a long and somewhat successful career as a runner, I never reached the superstar status of my dreams. It wasn’t due to a lack of effort. In fact, there were times when I trained as hard, if not harder, than many world class athletes. Where I fell short was in the category of innate ability. Whether it is sports, music, art, or business, the unfortunate truth is that the vast majority of us will never be superstars. That does not mean, however, that we cannot achieve a high level of success. The title of this article implies that success is a function of effort and ability. Notice that I capitalized effort, but not ability. This is to emphasize that effort is by far the more important component. Neither effort nor ability is all or nothing. Think of them as lying on a continuum. Some people work incredibly hard, others work hardly at all. Most of us fall somewhere in between. Some people possess a lot of talent; others possess very little. No matter what the profession, job, or sport, we can define four groups of people. If you are running a business, only one of these groups really matter to your success. Superstars posses tremendous innate ability and they work incredibly hard. They have great talent and they don’t waste it. Superstars achieve the highest level of success. They inspire others. They help those around them succeed and they help their organizations succeed. They even become legends. Every business wants to have at least one Superstar in its ranks. The problem is that Superstars are extremely rare. You’ll be very lucky if you come across one or two in a lifetime. Don’t bet your company’s future on your ability to identify, hire, and retain Superstars. At the opposite extreme are the Failures. They are easy to spot because they have little talent and they put in little effort. Failures could certainly be better than they are, but they will never get there because they just don’t want to try. Perhaps they are disillusioned or perhaps they are lazy. Whatever the reason, they won’t do the work that is required to succeed. Failures are also toxic to those around them and to your business. You definitely don’t want Failures on your team. There are two other groups that include the vast majority of people. Those in either group can achieve at least some level success, yet only one is worth finding and keeping on your team. The people you don’t want in your organization are those who are talented but lazy. I call them Waste Cases. These people have the potential to be Superstars, but they refuse to put in the work. They often achieve a certain level of success. In fact, they sometimes produce outstanding work. The problem is that when they succeed, they succeed in spite of themselves. What’s worse, due to their poor attitude, Waste Cases can be even more toxic than Failures. Nothing is more frustrating to a hard-working employee than being around another employee who is more talented, but who refuses to put in the effort. Because these people sometimes produce good results, they are much harder to spot than the Failures. However, if you really want your business to succeed, you need to figure out who they are; and you need to either turn them around or get rid of them. Finally, there are those employees who aren’t exceptionally talented, yet they work very hard. Because they are reliable and persistent in their work, for lack of a better term, I will refer to them as the Diligents. They work as hard as the Superstars, often coming in before everyone else and staying later. Sometimes they fail, but they don’t give up. You can always count on Diligents to get things done; and they often do an outstanding job. They also tend to be enthusiastic. As a result, they are a great influence on those around them. 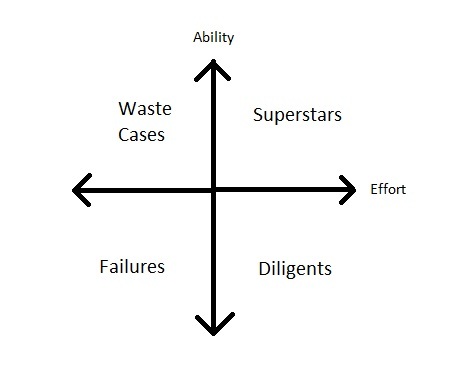 Because Superstars are so rare, Diligents are more important to your company’s success. They are the employees who are the most likely to help make you and your business successful. Find them and reward them. They are definitely worth keeping around.